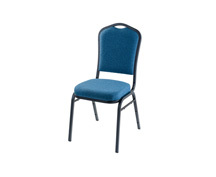 National Public Seating is proud to present its In-Stock Quick Ship Line of Stack Chairs in a huge variety of styles & colors for every application in your organization. With frames fabricated of high grade tubular steel or with solid steel rod construction and seats ⁄ backs made of either high density cushions or plastic construction, we have a style and color for every application. The #9000 Group are the perfect choice for auditoriums, worship centers, conference centers, etc., while the #8000 Group are built for the specific requirements of cafeterias, lounges and training rooms. 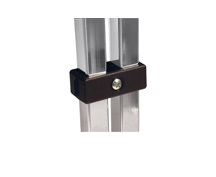 All materials used are of ASTM513 standards and all finished products meet or exceed ANSI ⁄ BIFMA standards for safety and durability. 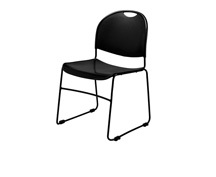 The #9000 Group begins with the #9100 Value Stacker; a basic tubular steel low back stack chair with 1." pullover seat cushion available with vinyl. Popular as an affordable solution for all seating venues, it includes a 19-gauge frame, underseat bars, and cushions of high quality upholstery. Most popular in the series is the #9200 Dome-Back Stack Chair, which has a full 2" thick waterfall seat cushion built on a plywood core with fabric or vinyl of only the highest grade materials. Top of the line in this series is the #9300 Silhouette Stacker for the most upscale environments. In addition to all the frame and cushion features of the #9200, it features a crown style backrest with a concealed double back for a more refined look. Our #8000 Group has the perfect frame style and plastic or cushion seat/back for each chair’s unique function. The #8500 Series is built on a solid rod frame with seats/backs in four plastic color choices. While similar in looks, the #8600 Signature Sled Base Stack Chair, is built on a tubular rod frame with three attractive fabric choices. 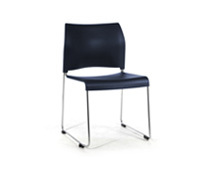 The #8100 PolyShell Chair is available in three one-piece shell color choices on a chrome tubular frame. The New Series #8700 Cafetorium Chair offers a sleek design with clean lines, in a new futuristic look. Perfect for cafeteria, auditorium, conference and lecture hall seating, this exciting design will dress up your facility, and is robust enough to last and last.